Merging multiple photographs into a single large panoramic photo can yield excellent results and with the proper software it can turn your small sensor camera into a 30 megapixel digital camera. Adobe Photoshop CS4 has an excellent Photomerge feature that automates the tedious process of lining up and merging multiple photos into a single larger photograph. 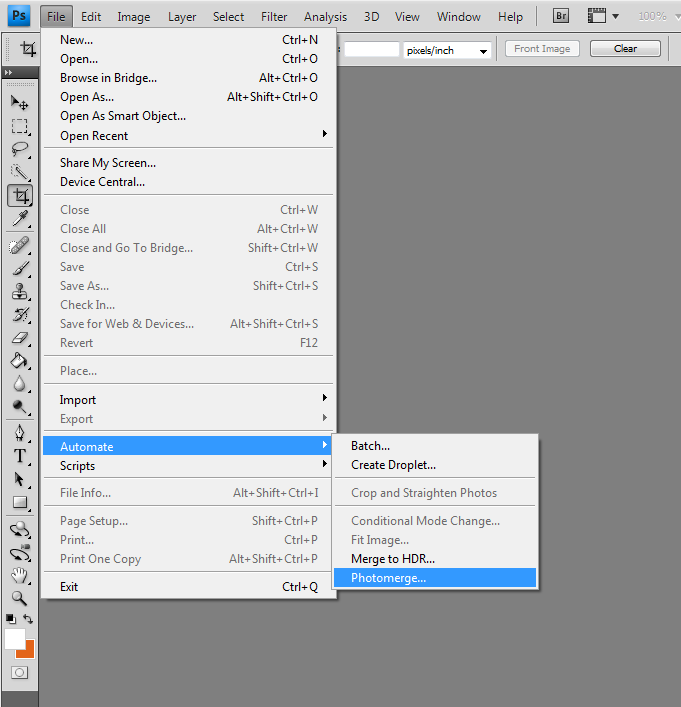 Below is the procedure for merging multiple photos into a single panoramic photograph in Adobe Photoshop CS4. 1) Open Photoshop and select "File" and then "Automate" followed finally by "Photomerge. 2) Next you will be greeted by a dialog box with several options. The Layout options give you many choices in how the final outputted file will appear. For good results I usually leave it on "Auto" and let Photoshop decide, this usually gives me decent results, but feel free to experiment with all the options here. 3) After you have selected your layout you need to select the source files. Select the browse button and navigate to the folder where the individual photos for your panoramic photo are stored. Now since you are merging multiple photos you can highlight or select all the photos at once and Photoshop will add all of them to the source files list. 4) Once your source files have been selected hit "OK" and sit back and wait for Photoshop to do all work of merging your photos. If you have a large amount of photos to merge and an older slower computer this step could take a very long time. 5.) When Photoshop has completed its merging of your photograhs you will hopefully have a decent looking panoramic photograph. You will notice that Photoshop has created several layers with masks. This will allow you to adjust individual sections if your colour balance or exposure varies a bit from section to section. You may also notice crack lines in the merged photo (see arrow in photo below). Do not worry about these lines as they will disapear when you flatten your image. 6) If you are happy with the general look of your photo you can flatten it to a single layer (this will eliminate the crack lines). To flatten your file go to the "Layers" menu and select "Flatten Image". When this is done you can crop your photo and adjust the colour balance and exposure on the entire photograph until you are ready to save and possibly share your new panoramic photo. 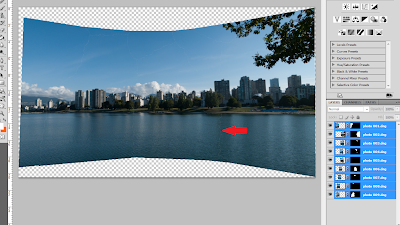 Below is the final version of the panorama from this short tutorial. spaccio woolrich bologna outlet woolrich Non hai detto ai tuoi discepoli tabù. Per il nome completo della divisione non vale la pena menzionare, se le persone riconoscono il tuo mezzo, basta dire si è in grado di svuotare i vecchi spaccio woolrich bologna discepoli. Vecchio mendicante ha detto, qui è una grande bocca e bevve il vino, la sua faccia non poteva fare spaccio woolrich outlet woolrich bologna bologna a meno di ottenere ancora un po 'solo. Sotto le stelle, la luna. Seduto a gambe incrociate sulla parte superiore dello spazio aperto di fronte alla grotta, rimuovere gli organi che contengono il succo spaccio woolrich bologna condensato . cheap ted baker uk sale blurted Fifi, I introduce you, this is my brother, like Ted Baker Outlet uk brother called him the text. cheap does not live up ted baker dresses sale to the title of ted baker uk sale king of lies, a new lie has been born. Seeing cheap eyes have changed, ted baker uk sale looking at cell phone in cheap ted baker uk the hands of glittering playing with suddenly startled out of their wits. No just said his cell phone, how to explain this. cheap ray ban sunglasses uk Ability to restore, cheap ray ban sunglasses uk sale mood, see the roadside wearing shorts beauty blowing whistles, beautiful to look at him uttered rotten scoundrels. sale laughed, cheap ray bans uk dig the crotch cheap ray ban sunglasses uk went forward. sale aimlessly walking in the street, elastic vests do not know where to go cut a button off a piece of cloth is tattered http://www.gadgetscene.co.uk shorts, shoes and open a larger hole, cheap ray ban sunglasses uk has revealed the three toes.